If spiders were to suddenly disappear from an ecosystem, you'd soon notice, writes Dana Wilde. Really it was more than summer camp, if not exactly a graduate seminar which about half of us in the group of 14 arachnophiles could not have earned a passing grade because of mind boggle. The college science professors and two graduate students among us would have done well because they have more practice (as well as lab skills) separating the scientific facts from the unutterable awe we all feel for biological order Araneae. The rest of us were awash in bedazzled appreciation. Our instructor was Dr. Kefyn Catley, a native of Wales in the U.K., and now a professor at Western Carolina University, who has been deep in spider world for decades. He led us through basic spider physiology, taxonomy and techniques of gathering and identifying specimens. We sat transfixed in his lectures (e.g., about 47,000 species of spiders have been identified, while it is believed that as many as 190,000 spider species walk the Earth) and went hunting for spiders in woods, fields and seashore there in the Milbridge area, which is where the most extensive count of spiders in Maine so far was made in the 2000s by Daniel Jennings and Frank Graham Jr.
We kept track of our findings, naturally, and after five days of capturing spiders in vials and taking them back to the lab to “key out” — meaning place them in petri dishes of alcohol, examine their intricate body parts under microscopes and match what we saw to minutely detailed descriptions in a professional identification manual — we collectively found specimens from 18 different spider families, just one short of the number Jennings and Graham list in “Spiders of Milbridge (Washington County) Maine,” published by the U.S. Forest Service. We found a lot of wolf spiders. Mother lycosids, as the arachnologists refer to members of the spider family Lycosidae, were abundant in the blueberry fields carrying white egg sacs in their spinnerets at the back of their abdomens. On the sandy beach at Petit Manan Island, another species of lycosids was darting around in little black lightning bolts of motion. We made a night walk in the woods on Eagle Hill and saw so many tiny, greenish eyes glimmering in the leaf litter it was like looking at star fields on the woodland floor. Many of them were lycosids, some were amaurobiids, or hackledmesh weavers, and some were agelenids, or grass spiders. 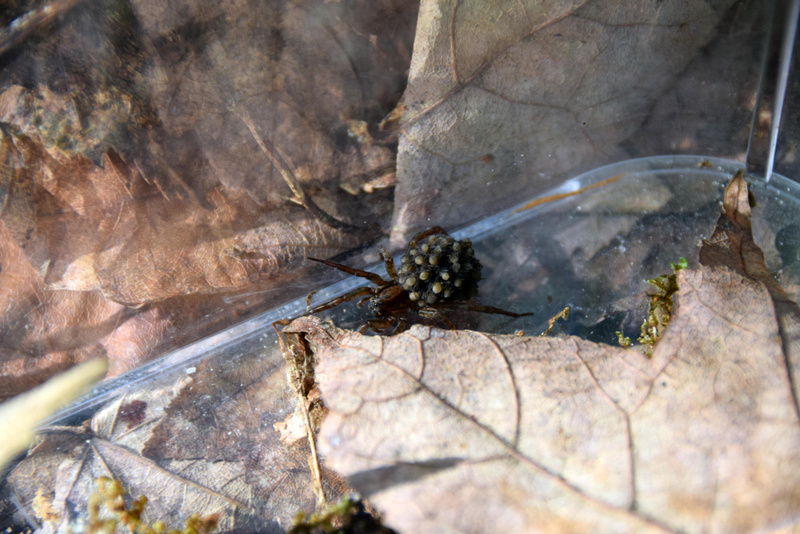 One of the actual scientists in our group, herpetologist Tom LaDuke, found a wolf spider mother with newly hatched spiderlings riding around on her back, an amazing sight I’d read about but never seen before. 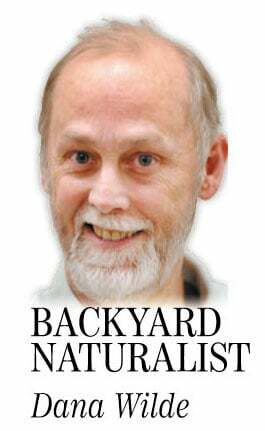 A few days later, fellow backyard naturalist John Smyth found another mother carrying her spiderlings on the trail at Tunk Lake. We explored for webs early in the morning, when dew makes them readily visible. We watched a movie about spider behavior; in one scene a fishing spider caught an actual small fish and carried it back ashore to eat. We considered the incredible uses and properties of spiders’ different kinds of silk (an engineer calculated that in theory, web silk scaled up to the width of a pencil has the elasticity and recoiling properties to stop a 747 aircraft). Professor Catley reminded us that spiders almost never bite humans. The first impulse of almost all spiders is to run from large danger, and even if they try to bite, the fangs on their mouth parts (called chelicerae) are so tiny they’re mostly incapable of even breaking human skin. Nasty welts which are sometimes diagnosed by doctors as brown recluse bites are, in point of fact, Catley said, almost certainly not brown recluse bites. They’re much more likely to be bites by other insects (which do target humans) that became infected for one reason or another. Brown recluse and black widow spiders have been seen in Maine, but rarely; it’s too cold for them. Spiders are our eco-allies. They’re generalist carnivores who eat so many bugs that if they were to suddenly disappear from an ecosystem, you’d soon notice — all kinds of bloodthirsty and destructive pests would become so numerous you’d start wondering if you were in a science fiction movie. The week at Eagle Hill wasn’t scary stories around a campfire. It was spider science, up close and incredible. The more I learn about them, the less scientific and more overawed I feel.